If you've been searching for the best cornbread recipes, your hunt is over. Gram Irene's makes a light and moist cornbread; Grandmom Murphy's makes a gluten free, southern style skillet cornbread that you can sweeten with a drizzle of honey after baking, if you're so inclined. Both of these recipes are featured in my book, “Never Buy Bread Again – 20+ Homemade Bread Recipes“, now available in spiral bound print and digital formats. Purchase the print copy and get a digital copy free! Click here to learn more. Whenever I make homemade baked beans, I always make up a batch or two of cornbread to go with them. When the boys were little we call it “cowboy food”, although I'm sure the cowboy version would have been a lot simpler and probably not nearly as tasty. My youngest also loves homemade cornbread with chicken and gnocchi soup, chili and other hearty soups. 1. Use fresh, good quality ingredients. I think most of us have had a bag of “something” get shoved to the back of the cupboard a little too long. Good cornmeal should smell fresh, slightly sweet smell. Rancid cornmeal will smell musty and stale. Dried corn contains oils, and once ground, it has a limited shelf life. If you use cornmeal infrequently, keep it in the freezer. Bring it up to room temp before you begin baking, or add extra baking time. 2. Mix gently by hand. Cornbread is a quick bread, not a yeast bread. There's no need for kneading – a few lumps are a good thing. Mix only enough to incorporate dry ingredients – more mixing can lead to tough cornbread. 3. Don't let your batter sit around. Have your pan prepped and ready to go, so you can get it in the oven promptly once mixed. Baking soda activates as soon as it's mixed with liquid. Baking powder activates when it gets moist and once again in the oven. 4. Add honey for more flavor and browning. If you like your cornbread a little browner with a slightly richer flavor, substitute honey for some of the sugar. You may need to skimp slightly on the other liquids or add a few minutes baking time to compensate if you switch to all honey. 5. Preheating your pan will make crustier cornbread. For a hearty Southern style cornbread, melting your fat or oil in your cast iron skillet doesn't just lube the skillet, it also makes for crustier cornbread. For extra crusty cornbread, keep the skillet piping hot so that when you pour the batter in, it sizzles. A hot skillet will trim your bake time by a few minutes, so plan accordingly. I got this cornbread recipe from my mom (Irene), after having tried it at her place and commenting on how good it was. The texture is great – really moist and tender, not dry and gritty. The “secret” is in the sour cream. You can make it with whole wheat flour, although I admit, I normally use white or a gluten free blend like Namaste. I recommend full fat dairy (sour cream and regular milk) for best flavor. The photo below ifs from the first time my youngest made cornbread by himself. He got so excited about baking that he climbed right up on the counter to mix. The “secret ingredient” keeps this cornbread moist, never dry or gritty. Preheat oven to 350° F and lightly grease a 8″x8″ square baking dish or 9 inch round pan. Blend dry ingredients together in a large bowl. Mix in softened butter. Blend in milk, sour cream and egg. Beat until moist. Pour the batter into prepared pan and place in preheated oven. Bake around 30-35 minutes, until surface starts to crack and edges pull away from pan. If you are using heavy glass bakeware, it may take 5 – 10 minutes longer. A toothpick inserted near the center of the bread should test dry when it is done. Enjoy warm or at room temperature with butter, baked beans, soup or meal of your choice. I've taken some flack from southern readers who say a proper corn bread shouldn't be sweetened at all. Given that my momma was not a southerner, I don't have a family recipe like that, but one of my readers was kind enough to share his. 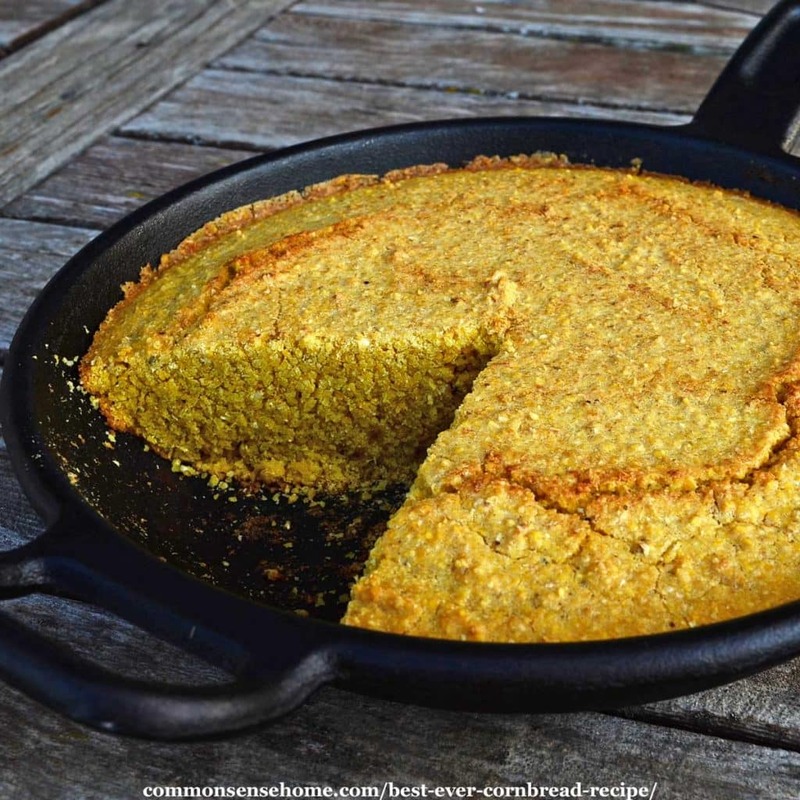 This recipe is an authentic southern style gluten free cornbread from Gerald Murphy. It's savory, not sweet, and made with only cornmeal – no added wheat flour. 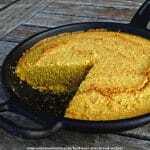 Authentic Southern Style Cornbread, savory, not sweet, made with only cornmeal – no added wheat flour. Oil a cast iron skillet. I pour my oil in the pan, run it all around, and then pour it into the batter. Blend all ingredients together in a medium mixing bowl. You can adjust the meal or buttermilk to get the right consistency of mix. The cornmeal batter should be fully wet but not runny. Pour the batter into the pan, scraping the bowl clean, and shake the pan back and forth until it levels out. Place cast iron skillet in oven and bake for 20 to 25 minutes. You can see the underneath edges turning brown when it is almost done. As soon as the top gets the least bit of brown on it, turn the over to broil (careful now–this goes fast) until it is the shade of golden brown you like (usually about 2 to 2 1/2 minutes). 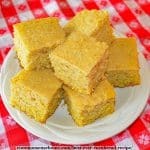 For cornbread, most people lean towards a medium grind cornmeal, which is more course than corn flour but finer than grits. “Stone ground cornmeal” tends to be courser, and usually has the germ and bran left in. This adds more flavor, but also shortens shelf life, so plan accordingly. To keep cornmeal fresh, store in the freezer in an airtight container, where it will last for up to two years. This is especially important for cornmeal labeled “stone ground” or “whole grain”, as noted above. If you purchased cornmeal that been degerminated, the bran and germ are removed and the product is more shelf stable at room temp. It's probably okay to store for a year or so in the pantry, but cool temps are better. Use the “sniff test” to make sure your cornmeal is still good before baking. Stale = a bitter, pungent smell; fresh = bright, lightly corn scented aroma. We do a lot of “from scratch” cooking, and I've shared over 100 family recipes and kitchen tips on the site. You can find them all listed by category on the Common Sense Home Recipes page. Thanks for stopping by, and I hope your family enjoys these recipes as much as we do. Please share if you feel so inclined. Sorry; But you are wrong girl!! wow, and living will kill us all. I know Ayurveda is a time honored tradition, but I don't understand the chemistry behind this claim (not cooking with honey). Sure, the enzymes are no longer intact after cooking, but I don't see any physical way it could become toxic. Could you please supply some evidence to back this assertion? i always avoid cooking w/honey. i use maple syrup instead. i have found VERY FEW folks, however, that follow this "rule". Hmmm, this is the first I've heard of any issues regarding cooking with honey. I've found maple syrup to be a good substitute most of the time though. My cornbread recipe is very similar to this one. It calls for white sugar though. I'll have to try switching the sweetener next time. I've slowly been converting most of my recipes as I make them again. a.. Honey should not be mixed with hot foods. b.. Honey should not be heated. For my part, I view honey as an extremely environmentally friendly sweetener, as raising honeybees enhances the environment, unlike the production of most other sweeteners. Honey is also shelf stable for years, unlike maple syrup. Honey, when heated above about 110. * , destroys all the good stuff that makes it healthy, leaving only sweetening. It does NOT make it toxic, just makes it less healthy as all the healthy attributes have been destroyed. I HAVE SEEN WHERE YOU CAN HEAT HONEY TO GET IT BACK TO ITS NATURAL FORM IF IT CRYSTALIZES. also WARM TEA WITH HONEY. tHIS MAKES NO SENSE. Well, my email has bounced back already, so no answers from Mr. libido-increaser. For my part, I'll still be using honey, unless I get a better explanation. Not sure I buy it either. You heat honey when it goes sugared, so why would cooking with it make it toxic. I’d be interested if you find out more. I researched, but the only thing that ever came up was that heat destroys the natural enzymes, so it looses some of it’s vitality and medicinal qualities, but it certainly still sweetens. I don't know what the heck is the deal with heating honey. Not so sure I'd buy that until I had some good evidence. Anyways, this recipe SAVED me! I'd just made a total flop on cornbread muffins from a food.com recipe. I know it's foolish to try a new recipe last-minute, but I couldn't find my old standby. So right before a luncheon, I made these after throwing the other "bricks" away. This turned out great! I had to bake them longer than 25 minutes recommended for a Pyrex. I made two 8×8 pans, but I'd love to know what you'd recommend for cooking time/temp for muffins. Amy – glad it worked for you. I've never made these as muffins, so I'm not sure. I usually bake most of my muffin recipes at 350 or 375, for around 18-25 minutes. Don't cook with honey!!!!!!!! What!!!! Toxic!!!! If it turns toxic then why did I not die from it or even get sick. Been using it in baking, etc. all 38+ yrs of marriage. I'm still standing and in very good health. Pamela – I hear you. I can't seem to get a straight answer from anyone making the claims. can I substitute plain yogurt for the sour cream or do I need to run to the store??? Plain yogurt should be fine, although it might change the texture a bit. I've used plain kefir, too. Well I put honey in very hot tea &/or coffee daily and its in my granola recipe & we’re all alive & well so I’ll just roll my eyes & maybe add a “whatever” whenever I see those unsafe claims, lol! Gonna try this recipe thanks! Good timing! Hubby is planning his chili for tomorrow’s ‘big game’ so maybe I’ll whip off some of this corn bread to go with! Sounds fabulous! Ginger – here, here! I like honey in my coffee, too. Aagard Farms – I hope you like it! Corn bread sounds great! But what I really want to know is – what is your baked beans recipe?! I have yet to find a satisfactory baked bean recipe from dry beans that my family will eat. So, what do you have? Please share! Oh thank you. Don’t know how I missed that link right at the top! Can’t wait to try the recipe. This is seriously the best cornbread ever! I am now famous at family gatherings for using this recipe :-). Thank you! P.S. I used honey! And heated it! And I will do it again! lol – Amy – you’re a wild woman! The only thing I have ever read about heating honey is that heating it makes it lose some of its sweetness…never read or heard that it was toxic other than to small children. I used 1/2 cup of honey to replace sugar and it tasted great! My kids have all eaten and we are all alive! Love your recipes! Honey is recognized world wide as a natural preservative in baking. It’s recognized by the USDA, Health Dept.s across the country, and is taught in many culinary arts schools to be used in such a manner. So take that Mr. Libido… blame your impotence on something else! lol – Love it, Jennifer! I know my low sugar jams made with honey are the bomb! The flavor is sooo good. While it may give superior health benefits to eat it raw, using it in baking and cooking is a great way to support local apiaries – and tastes good, too. In addition, honey used in baking applications may improve the functionality of a product, as honey is a natural binder and thickener. The National Honey Board’s baking-specific Web site, http://www.BakingWithHoney.com, highlights recipes and substitution formulas, as well as profiles of bakers who use honey to enhance their products. My parents are from the south and cornbread was/is practically a staple at our table. We’ve used the same family recipe for literally generations, but this recipe by Irene is,unbelievably, better. Quite possibly the best cornbread I’ve ever made. As we are not fans of sweet cornbread, I used a little less sugar, but other than that, I wouldn’t change a thing. It is the “new” family recipe! Linda, I’m glad you enjoyed it. We are not big corn bread eaters, but this was my mom’s recipe and everyone I’ve served it to has gone back for seconds. Honey is toxic when cooking with it? Sounds like the same scientific BS that scientists regurgitate when trying to make the case for Global Warming aka climate Change! And we now know that was all a lie when the emails of these so called “scientists and scholars” showed they were lying about their data in order to get more grant money. I wonder who gains to benefit from saying honey is toxic when cooking with it. I would say that we have much bigger problems from GMO (Genetically Modified Organism) foods than natural honey. Joy – I’m with you. It may loose some of its healing properties, but I don’t think safety is an issue at all. Can I do this without sour cream, or should I run to the store? You need some sort of sour something to get it to rise. I’ve tried substituting plain yogurt and sour milk, but sour cream works best. While raw honey is probably the best. Unlike other sugars, honey is more quickly and efficiently used as energy and is non-fattening (Ayurveda says that it is anti-kapha). HMF (HydroxyMethylFurfuraldehyde) is used as an indicator of heat and storage changes in honey. While it has been found to be toxic to honey bees, it is not toxic to humans. In fact much higher levels are routinely found in molasses and other sugar products. Another issue is that honey collected from the wild would often contain wax, and it was then heated and the wax would separate and float to the top for removal. Some ayurvedic texts describe heating or burning this wax to release a toxin. However, modern apiists are able to extract honey without heating and without wax. what would I have to adjust to make muffins instead of a bread? Bake at a higher temp for a shorter amount of time – maybe 375 for 15-18 minutes? I just use whichever I have on hand. Love corn bread, my husband, not so much. I use a recipe that adds a can of creamed corn and a can of whole corn, undrained. I also use onion dip instead of plain sour cream. I just take my recipe with me when I take this cornbread “dish”. If I am making it for just “us” I may add some garlic and a can of ortega diced chilies. I know, it is not real cornbread but really yummy served with anything. I am new to growing my own food, chickens etc. I really enjoy this newsletter and just want to say thank you very much. My husband and I had some terrific moist cornbread many years ago. I have tried several different recipes. So thank you for sharing the recipes looking forward to making it. Will let you know if I finally found the recipe I have been looking for all this time. Yum! Looks good…I’ll have to try this one! I love cornbread and I am always on the lookout for new recipes to try, thank you! I hope it works well for you, Carol. I am from Oklahoma We eat cornbread. We eat it plain and unsweet we also eat it sweet or with extras like ham, jalapenos, cheddar, green chillies etc. You have have corn sticks or muffins or in a iron skillet. you can put it on top of chilli and bake that. it is very versatile. It can be so sweet it is like a cake that does not need frosting. The only thing you dont want it is to be dry. Leave it lumpy when you mix it. if you add sugar to a recipe to make it sweet remember sugar is a liquid so be sure to hold back a little of the milk. Have fun with it and let anyone tell you there is only one kind of cornbread. It is like saying there is only one kind of women. Variety is the spice of life. DID I MISS SOMETHING when you advised: “Blend dry ingredients together. This may require you climbing on the counter to get closer to the bowl and ingredients.” What does this mean?? I’m pretty short but I can still reach my bowls on the counter to mix ingredients without climbing on the counter! Was it a joke? Again, what am I missing?? I can’t understand from the photo why the young boy is sitting on the counter to make this recipe. He looks tall enough to stand and still reach the counter. As I don’t see any other comments about this, I must be pretty dense. Please enlighten me! It’s a joke. 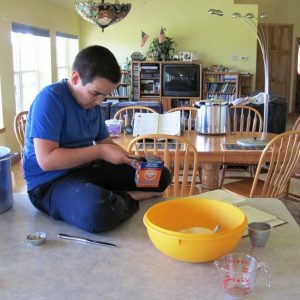 When my son was littler, he used to climb on the counter to mix everything, whether he really needed to or not. When he was really little, he’d hold the bowl steady by wrapping his legs around it. The best cornbread, and corn muffins, comes from the best corn and eventually corn meal made from that corn. Harry Records, owner of “Harry Here” farm, grows a nearly extinct white-capped flint corn in the swamp regions of Rhode Island. It’s grown a mile away from any other corn to prevent cross-pollination. Harry grinds the corn using an ancient water-powered stone mill. The slow speed produces a corn meal that is a bit coarser than modern high-speed milled meal. All the yellow corn meal from 2014 has been sold, so we wait until this fall … and buy extra. The farm is named after the way Mr. Records answers the phone. 1/4 cup bacon grease makes corn bread awesome! Heat it on low in a 10 inch cast iron skillet fix up the rest of your corn bread , then add the grease. Pour batter back into skillet and bake at 400 til done. Yum! The hot skillet puts a nice crust on the bottom. My grandmother used to fully cook her corn bread on top of the stove. 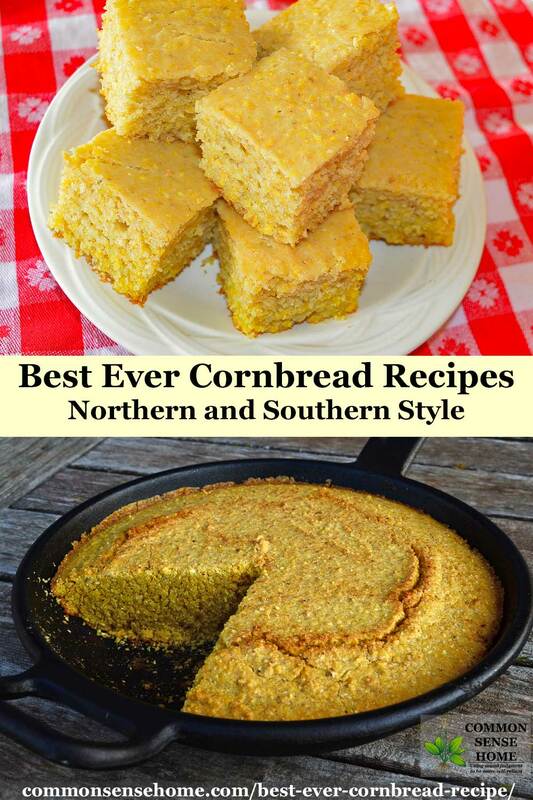 Whether you choose to make Northern or Southern cornbread cooking your cornbread in a cast iron skillet is a must.